I just took some empty jars to the cellar and took an accounting of what is left from summer 2016 canning. Full shelves from canning season 2016! They were completely full in October but now supplies are dwindling! We have a huge pile of potatoes leftover and will probably sell them in the coming months. I’ll can about 15-20 quarts but the rest will go in the garden for seed and we’ll eat some more until they start sprouting. They’re bakers and peeling size and have been so good throughout the winter. Hubby has plowed the garden and we’re hoping we’ll get some spring rain on it before we disk it up for planting. We use the Kubota tractor for plowing. Our garden site has very rich soil and always produces more than we can eat and preserve. It also seems to get bigger each year!!! This year we’ll plan the usual crops of green beans, corn, potatoes, tomatoes, squash, broccoli, brussel sprouts, melons, sweet potatoes, cucumbers, and in the fall some turnips and field greens. Hope your planting season is grand and praying we have an abundant season this year. In the coming weeks I’ll be cleaning off the various asparagus patches we have and watching the rhubarb show its sprouts already. I had six grape vines started new last year and they all survived but one. I bought this red grape to replace it. It’s a red seedless grape and I love them. Hope they get as large as the one’s we buy in the grocery but know it will be a couple of years before that happens. We also went to Food Lion yesterday and bought three dwarf apple trees for the orchard at the mansion. Dwarf red delicious – once this starts bearing fruit we’ll take cuttings from it and graft to some new root-stock or some wild apple trees we find every year on the farm that we’ll transplant to the orchard. Dwarf yellow delicious-dwarf trees don’t last as long as standard trees but they give you fruit quicker. This is a dwarf McIntosh which is hubby’s favorite. We have one tree in our large orchard but it’s really old and we lose an old standard about every year. This is the mansion orchard where the dwarf trees will be planted. The pond is close by and a mountain spring runs through it to make for easy watering. Last years grape arbor is where the new red grape will be planted and is right beside our garden. Grape arbor in the backyard. Every spring I try to add 2-4 new fruit trees to our dwindling orchards. The past few years have been apples and peaches. My daughter got me two new cherry trees for our anniversary and they’ve been planted in the back of the apple orchard and fenced to keep the deer from eating them up. Last year I planted four new grape vines along with some English walnut trees . All of the grapes have survived but I lost one walnut tree. This year I ordered two Green Gage Plum trees and two Black Tartarian Cherry trees from Aaron’s Farm (http://www.aaronsfarm.com/) . The plum trees are three years old and about four feet tall and the cherry trees are three years old and 5-6 feet tall. The were shipped bare root and pre-pruned. We set them out yesterday evening and watered them well which I will continue to do daily until we get some rain and there after as needed daily or weekly depending on the moisture in the ground. The Green Gage plum tree is an ancient European plum descendant that has been extensively grown and propagated in England and France since the 1700’s. My grandparents had these plums on their farm in Paint Bank, VA for years when I was a young child and we would eat them until they ran out our ears. I’ve not seen any for years and have been looking for them for about five years and lucked out with Aaron’s Farms this spring. I can’t wait to have some “green gages” in a couple of years. Green Gage plums are green-skinned when completely ripe with a pink overlay at the base of the fruit when tree ripened. The flavor is deliciously sweet with a slight sour taste to the skin. The black cherries are my husbands favorite and most of the cherry trees on our farm have died or only produce pea size cherries. I’m hoping these will bring back some good memories especially when I make him some cherry pies in a couple of years. 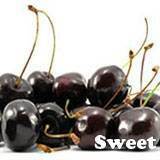 The Black Tartarian Cherry tree is a sweet cherry with a black skin and bright red pulp. They are cold hardy which is one of the reasons I chose this type. I can’t remember the name of the cherry trees my daughter got for me but think they are a red cherry. In June of this past summer, we had lots of tree and fence damage from the “duratio” that hit our farm. I’ve never seen such wind and we were very lucky that we had no more damage than we did. We did loose several apple trees and hubby has been working hard since that wind storm to get things back in order. Hubby started the clean up in the orchard today and got all but one of the downed trees cut up and hauled off. It looks kind of bare now but hopefully we’ll fix that. Here’s a picture of the cleaned up orchard as of this afternoon. We won’t be able to replace those trees with the same type because they were trees grafted by the family years ago. Luckily there are several of the same type in the orchard and I have 30+ apple stock in the cellar that are two years old and ready for grafting. I need to get out soon and cut scion from the trees we have left and when spring truly breaks I’ll get that new stock in the ground, grafted and wrapped and shielded from all the wildlife that love tender buds. I’m looking forward to another try at grafting myself. Hubby is a real pro at it! I’ve taken the classes but think maybe I try to hard. We’ll see how they fair toward the end of summer and look for new sprouts on the grafts. I LOVE FARMING!!! Fall is definitely here. We have picked our first apples of the season and not because they were necessarily ready but because the sand hornets (huge ugly yellow bee) had started eating them. We don’t have a lot of apples this year and may not even have enough to do our annual cider press but there were about 30 good apples left on the tree so we decided to get them. We peeled and sliced them pretty quickly and they’re a very dry apple which I thought would make good apple pies and fried pies. I cooked them up and they’re beautiful. I didn’t have to press them through a sieve. I put them in airtight freezer containers and froze them for winter goodies. I kept out three cups for breakfast and my applesauce cake which I plan to make now. I’ll share the recipe soon! You know that summer is coming to an end when the kids start back to school but the real clues are when the garden is being cleaned off for the fall crops, the woodshed is full and the cellar shelves are stocked. I was riding home yesterday and saw a hint of gold and orange in the tops of maple trees on our road. Last night we saw a herd of deer near the house and three of the larger bucks had lost the velvet from their horns. The apples are starting to drop and the wildlife is scarfing it up almost before it hits the ground. The hummingbird population has dropped from 30 to 10 or 12. The chickens molt has come to an end and the new feathers are shining. The cats and dogs on the farm have almost quit shedding. The katydids are screaming way before dark and the evening porch sitting is so much cooler. Best of all, the screech owls are calling!! Fall is near!! I can’t believe it’s the end of July! This year has flown by!! It’s time to start aggressively storing food for the winter, gathering wood, and winterizing all the animal sheds and the house. I’ll save the house for last since the next two months will probably turn out to be our hottest months. The farm equipment should be finished for the year except for a couple tractors. Hubby always cleans them up and checks everything out for worn parts and replacement parts. I clean up the garden and yard equipment but still a little early for that. The major thing now is the garden. I will have more green beans to can this coming week and weekend, more squash to freeze, onions to store and more cabbage to do something with. The tomatoes and peppers are near ready yet and the summer “duratio” did away with most of the fruit. Luckily I stored lots last year. Hubby worked on filling the wood house again today and the split stack is out of the rain. We still have a large load to split and more down from the storm to cut & split for the following winter. All of the hay is stacked and ready for winter and hubby is in the process of cleaning up the hay equipment. The roofs have been taken care of and I have to put new interior tar paper in the chicken house. All of the major fence repairs have been made and the pastures are being sheared now. We only have four cherry trees on the farm at present. Three of the four produce pretty decent cherries usually in late May or early June depending on the weather. My hubby really looks forward to them ripening and he loves cherry pies. This year only two of the trees outwitted the late frost and produced for us. Hubby kept checking them and was anxiously awaiting their ripening. He wasn’t aware that someone else was watching and waiting right along with him. Guess what?? The critters beat him to them and one of the trees got a very bad pruning. The smaller of the two was robbed of their fruit by birds and raccoons. The largest and sweetest cherry producer was invaded by three black bears. On one given day it was visited at the same time by three. There were two that were probably three years old gageing by their size and then there was the “big boy”. The last time I got to see them, the two smaller (125-150 pounds) were taking turns up and down the tree and having the times of their lives UNTIL the big guy showed up. They were pretty quick to leave the area with him around. The “big boy” stayed for a good while and that’s the last I saw them but hubby watched him tearing that tree to pieces, stripping it clean of all cherries for about two weeks. After they were all gone and hubby was so disappointed, I went to WalMart and bought him some for the pies and the ice cream. I froze the last basket to have for out next batch of homemade ice cream because they just won’t keep very well once we get them home. We were happy to see the bears but not so much when they took all the cherries. Maybe next spring will be a different story!! We had a major wind storm with some hail behind arrive at our home last night around 8:30. We lost power for only four hours and most of the county is still without power. I’m including some photos of the damage we found today. We are safe but will be cleaning up the aftermath for several weeks. God was watching over and kept us safe. The trees, hay, buildings and fences can be repaired and as I said before that are others in the county a lot worse off than we are! September and October are my favorite months in the fall. It’s also the one time of the year that we invite friends, neighbors and family in for some fun on the farm making cider. We have two small apple orchards and if the frost is light in the spring it means we will have apples come fall. We always hope for a bumper crop of apples!! We have about 30 apple trees on the farm and most are old, old trees that have been here through three or four generations and in the last 20 years haven’t been cared for. We are in the process of grafting about thirty new rootstock in hopes of keeping the orchards for generations to be. The grafts weren’t very successful this year but I’ll try again next spring. My post is to show the fun we have with our family and friends at least one Sunday afternoon making apple cider. About two weeks before we make the cider I email or call everyone we would like to visit and give them the date and time. We usually have about 20-30 adults and children. Our granddaughter helps to entertain the children and our kids help with the preparations if they can. A few days before the gathering we head out on the tractor gather up 15 – 20 bushel of apples trying to mix some tart and some sweet for the best cider. We have our own cider press and some years back a motor was attached to it and the cider making becomes more fun than hard work. We clean out the barn, clean the press and bring out the gallon jugs I’ve been sterilizing and saving for the cider. I plan a small menu for a meal at the house after the cider making is complete. We just have some good old fashioned fun and at times teach someone not as lucky as we are what life is like on the farm! Once the apples are picked and about an hour before the gathering, we bring out a large galvanized stock tank and fill it with cold water, dump in the apples and give everything a good washing. Mind you, we DO NOT spray our apples at anytime of the year. They’re as natural as can be and if a worm might get in the apple, we figure that some natural protein to add to the juice :)!! You will hopefully be able to see the REST OF THE STORY in the following photos I’ve taken over the years of our gathering! While you’re at it go to an orchard in the fall. It’ll be the best trip you’ll take all year!! After all the apples are pressed, we strain the juice through several layers of cheesecloth into those wonderful old milkcans. Then the jugs are filled to the rim and handed out to any and all that would like to have some. Everyone lends hand in the cleanup and then we head to the house to have a meal and drink some fresh cider. Everyone heads home with a full belly and a jug of cider. Those that hang around for awhile sit on the porch to chat or take a spin around the pond in the paddle boat or play a game of badminton or just listen to the quiet (unless the kids are having a good time in the front yard)!